Are you thinking about visiting Florence and the Uffizi this summer? 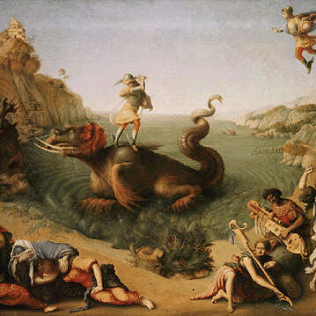 You will have the occasion to visit the new exhibition at the Gallery, dedicated to Piero di Cosimo (1462-1522). It is the first monographic exhibit dedicated to the Renaissance artist and to his very particular style. Born Piero di Lorenzo, his nickname is due to his apprentice under Cosimo Rosselli, another Florentine artist. However, Piero developed a personal style, influenced by other colleagues, like Filippino Lippi, Domenico Ghirlandaio and – above all – Leonardo, for what concerns the details of atmosphere. His interest in Flemish artists is also essential for his work. From Flemish artists and from Leonardo, Piero absorbed the interest for the precise reproduction of nature that, in his paintings, creates an unusual – for the Florentine style of that times – wealth of detail. Our artist – that worked at the frescoes of the Sistine Chapel with his master – was also interest in the in the antiques, as we can notice from his mythological paintings. From these various sources of inspiration fantastic and particular paintings were born, that put Piero halfway between Renaissance and Mannerism. The author was an eccentric man: Vasari’s biography describes Piero as a very odd man, that was so absorbed in his art to seem almost crazy to his contemporaries. Vasari went so far to say that he lived “more like a beast than a man”. The biographer also supposed that Piero’s eccentricity has – in some way – limited his fame and his career. Now – thanks to this event – we can rediscover this artist, too often forgotten in modern times, even if his paintings are in many museums around the world. The exhibition shows altarpieces, paintings of secular subject, often commissioned by important families for their houses, and several portraits. There are also some works by other artists of the same period, that help visitors to put Piero’s work into context. Currently the exhibition is ongoing at the Washington National Gallery, that owns the Visitation by the artist, and that is partner of the Uffizi Gallery in this event. This exhibition is a very precious occasion to discover this eccentric genius, too often neglected by the public!